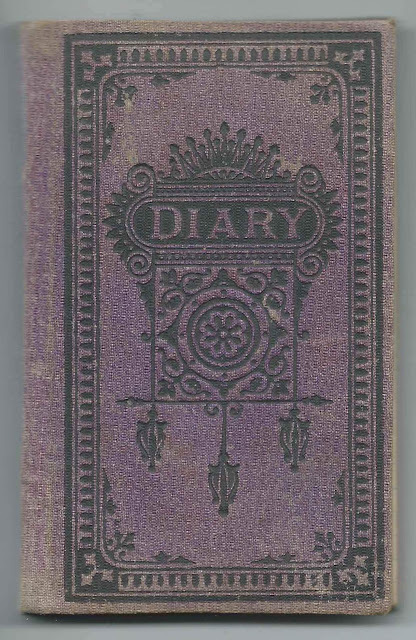 1909 diary of Carrie E. (Farnham) French (1845-1919) of Glenburn, Maine. Carrie was the wife of Abner Taylor French (abt 1846-1926). The family lived on Pushaw Road in Glenburn, presumably near Pushaw Pond; ice harvesting is mentioned several times. Although not discussed in the diary, Abner served Glenburn as a selectman and school supervisor. Note the initials C. E. F. on the first end paper. The entries are set into an 1873 diary that Carrie drafted into service for 1909. She changed the days of the week to fit the 1909 calendar. The diary, which measures approximately 4-3/4" by 3", contains a calendar, general information pages, Memoranda and Cash Account sections, in addition to the diary pages, which cover three days per page. An alphabetical surname list and an alphabetical list of people mentioned in the diary appear late on in this post. If you have information on the French family or any of the other people mentioned in the diary, please leave a comment or contact me directly. 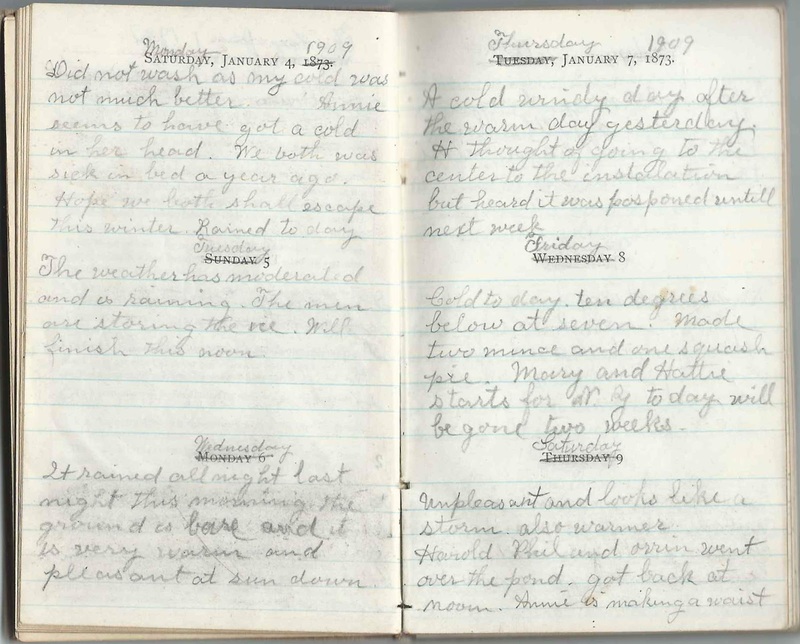 Carrie described the weather daily and noted chores, both household and farm, as well as meetings, visits, a birth, a Golden Wedding reception and deaths and burials. She stayed mostly in Glenburn, with occasional visits to Bangor and Old Town. It took a while for me to unlock Carrie's identity, since she didn't spell out her name and location at the beginning, and I had no idea of the locale of the diary until I had transcribed far enough into it. To start, I made the assumption that the diary came from Maine, and, if a dead end, I'd expand my search. As I transcribed, I came across the many times that Carrie's husband made trips to B - could it be Bangor, Maine? The first real clue was the burial of a Mrs. Goodin on January 27, 1909. It wasn't until I checked Goodwin rather than Goodin, that I found a record of the death of Angeline (Leighton) Goodwin on January 25, 1909 at Glenburn, Maine. Once I'd identified Glenburn, which, nicely enough, abuts Bangor, Maine, I could check other people, mentioned only with their first names, to cement Glenburn as the diarist's home. Carrie's daughter Martha Beulah French (1870-1946), "Mattie" or M, who was off on nursing jobs at times. 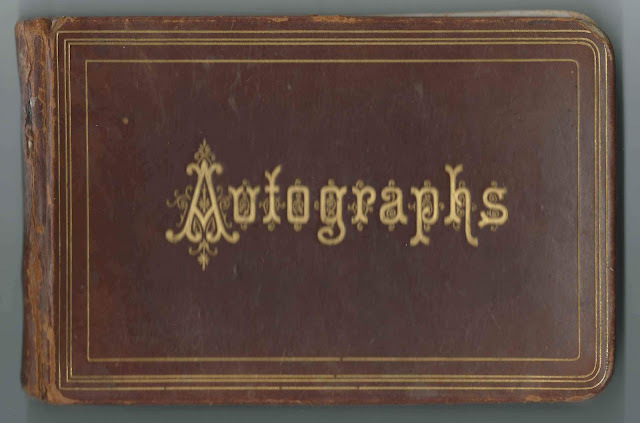 Mattie would eventually marry John Wesley Sanford (1858-1940), whose first wife, Lizzie Ann (Vague) Sanford, died in March 1909, an event mentioned in the diary. Carrie's son Harold Francis French (1881-1961), usually called H, who lived nearby and helped on the dairy farm. Harold was married at the time to Geneva Maude (Richardson) French; they had divorced by 1914, when Maude married Charles Clarence Collicutt at Vancouver, British Columbia, in 1914. Harold married Ina Adelia Parks at Glenburn, Maine, in 1920. 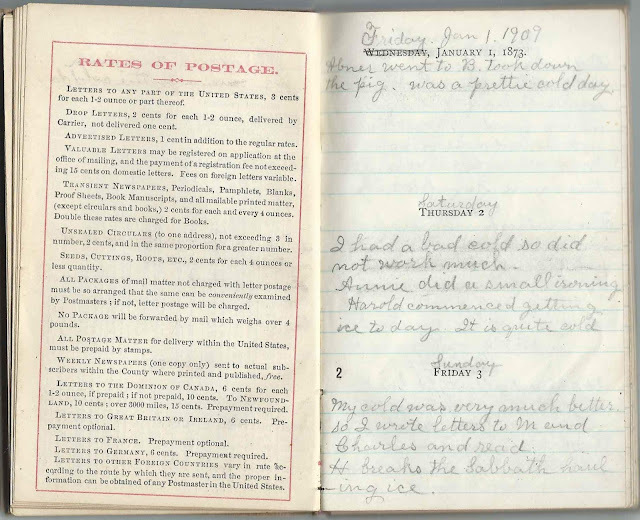 Interestingly, Ina and her mother, Addie (Farris) Parks, were mentioned in the diary. 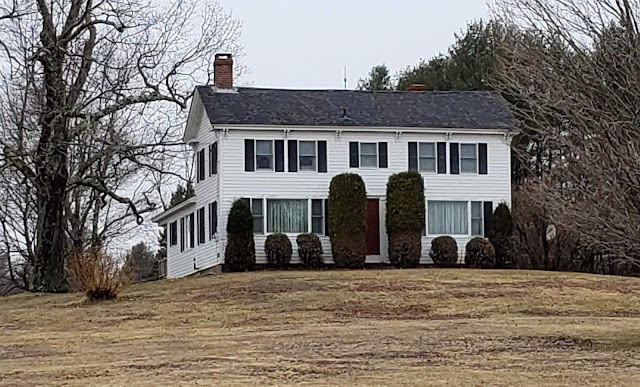 After a reader told me where the home of Abner Taylor French and Carrie E. (Farnham) French was located, I took a photograph, shown below. The house is located across from the intersection of Pushaw Road and French's Point Road. It's set back a bit from Pushaw Road. Allen [2 or 3] Hart Parker ? Dunton Marston T Taylor ? French  O Olen or Allen Wilson ? "Mattie came home from Newtonville, been gone 17 weeks." - entry of February 25, 1909. Mattie was a home care nurse, it appears. "Mr. Allen died this morning." 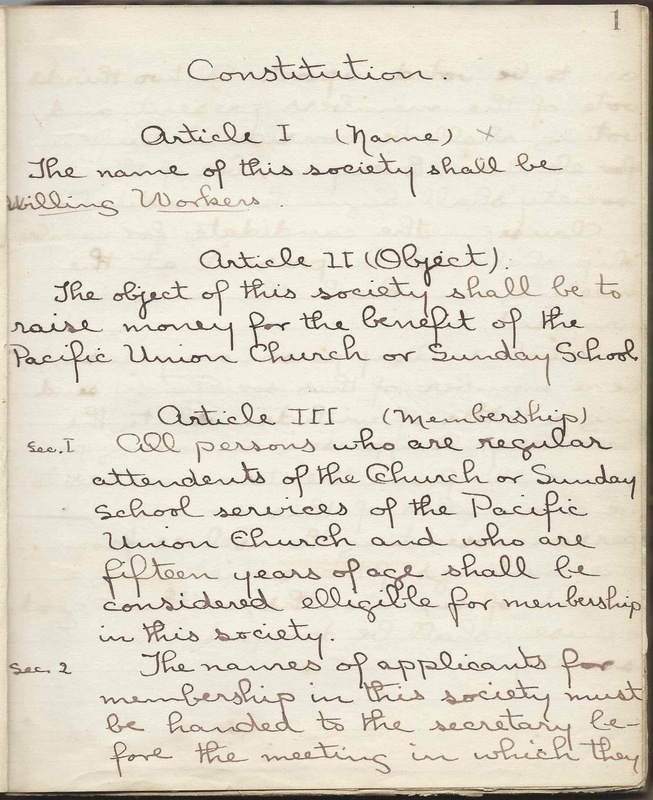 - entry of March 21, 1909. John H. Allen. The death date on the FindaGrave memorial is apparently in error, unless the date changing on the diary, printed for 1873, confused Carrie. 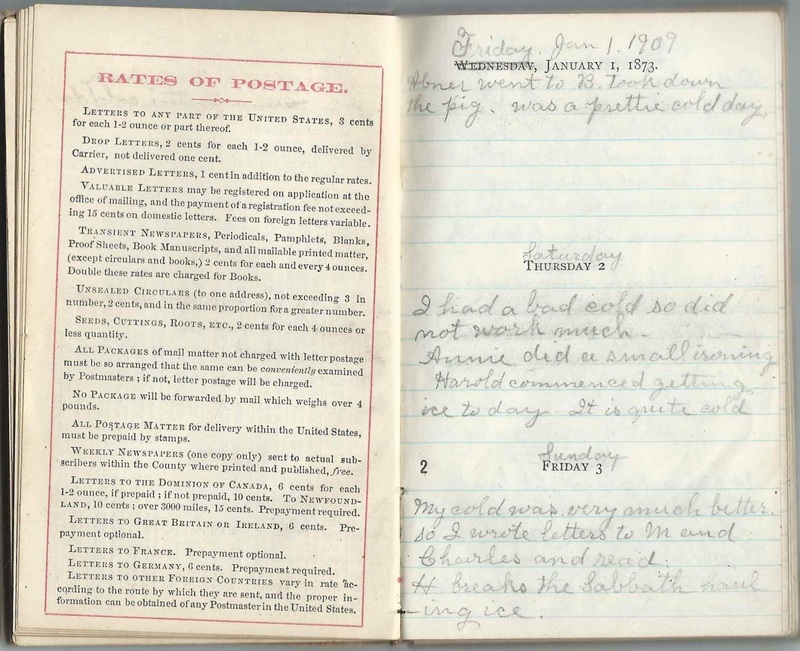 The entry of March 24, 1909 notes Mr. Allen's funeral. "Mrs. J. Sanford died this morning." 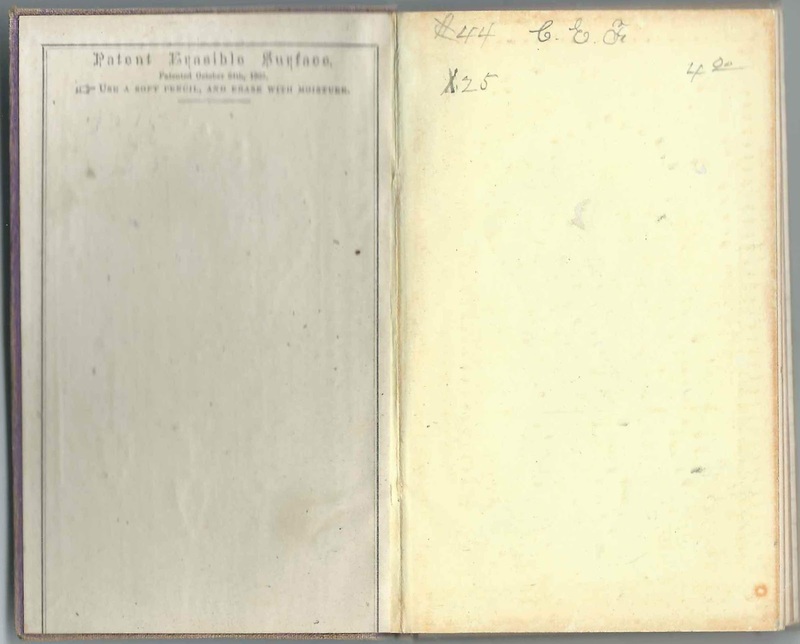 - entry of March 25, 1909. Her burial was noted in the entry of March 27, 1909. Lizzie Ann (Vague) Sanford, wife of John Wesley Sanford. In 1913, Carrie's daughter Mattie would marry widower John Wesley Sanford. 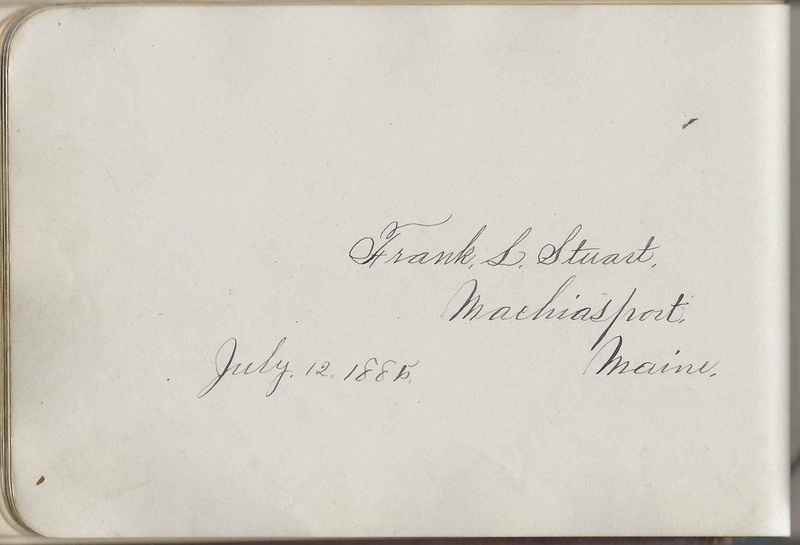 "Mary and Hattie came up with Annie on the 3-5 car this P.M."
Hiram - had a boat to take on the pond - Pushaw Pond? Mrs. Brown on Broadway, presumably Bangor, Maine; Carrie's daughter Mattie Beulah French is staying with her, probably because Mrs. Brown needs nursing care. Abner Taylor French (1846-1926), "Ab" or "A" of Glenburn, Maine; husband of diarist Carrie E. (Farnham) French (1845-1919); he and Carrie and son Harold operated a cow farm. Read more about Abner and his ancestors here. Geneva Maude (Richardson) French, "Maude", first wife of Harold Francis French (1881-1961); they divorced and she later married Charles Clarence Collicutt at Vancouver, British Columbia, in 1914. Harold Francis French (1881-1961), "H", of Glenburn, Maine; son of Abner Taylor French (1846-1926) and diarist Carrie E. (Farnham) French (1845-1919) and husband of Geneva Maude (Richardson) French at the time of the diary, 1909; they would part sometime before 1914 when Maude remarried. Harold later married Ina Adelia Parks. Martha Beulah French (1870-1946); "Mattie" or "M", daughter of Abner Taylor French (1846-1926) and diarist Carrie E. (Farnham) French (1845-1919); Mattie would marry John Wesley Sanford (1858-1940) in 1913. 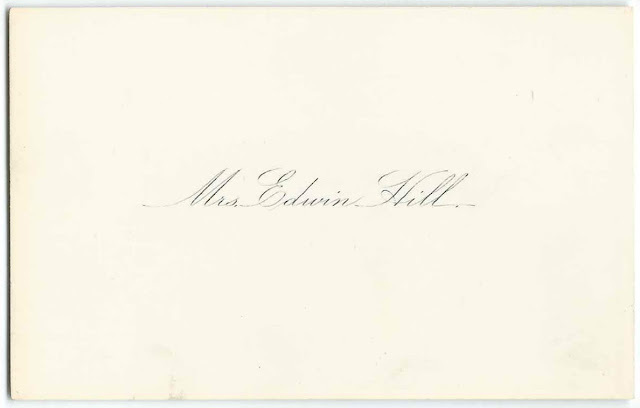 Elbridge J. Leighton (1838-1926) and Abigail Janette (Eastman) Leighton (1840-1921) - the Golden Wedding Reception, noted in entry of April 19, 1909 was probably for them. Addie Parks - presumably Addie (Farris) Parks, mother of Ina Adelia Parks, who married Carrie's son Harold Francis French in 1920. Ina Adelia Parks (1978-1966) - became the second wife of Carrie's son Harold Francis French (1881-1961) in 1920. Vivian Richardson (1885-1971), sister of Geneva Maude (Richardson) French, wife of Harold F. French and future wife of Edgar C. Reed (1883-1854); "Vivian came up to Maud's today." Lizzie A. (Vague) Sanford (1863-1909), wife of John Wesley Sanford (1858-1940), who would subsequently marry Carrie's daughter Mattie Beulah French in 1913. 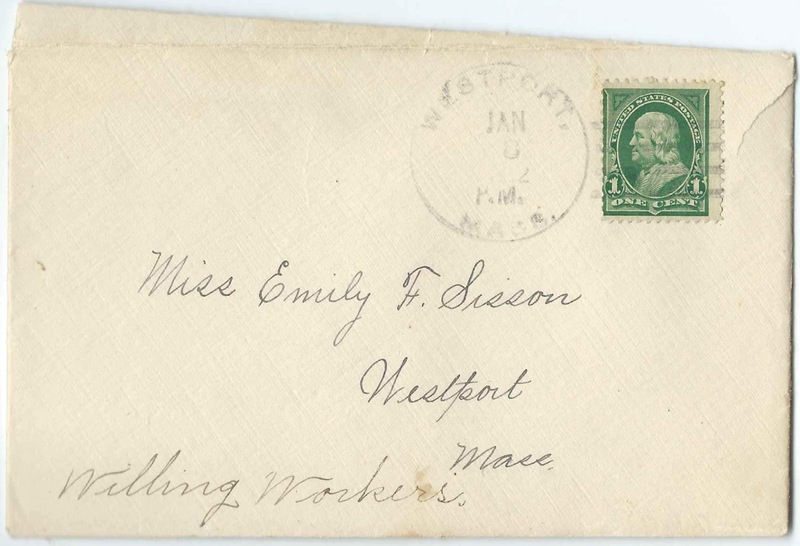 "Mrs. J. Sanford died this morning" - entry of March 25, 1909. Lizzie's burial was noted in the entry of March 27, 1909. "Mrs. J. Sanford died this morning"
John Sanford; perhaps John Wesley Sanford (1858-1940) of Glenburn; his first wife died in 1909 and he would subsequently marry Martha Beulah French (1870-1946), "Mattie"
Vickery Family - perhaps the family of Edward William Vickery (1842-1922); his sister Ellen Marie Vickery (1836-1915) was living with him. Reward of Merit presented by teacher Edmund Bicknell to student Almeda Greer, presumably in the late 1860s or early 1870s. People of these names were found living in Belmont, Maine. 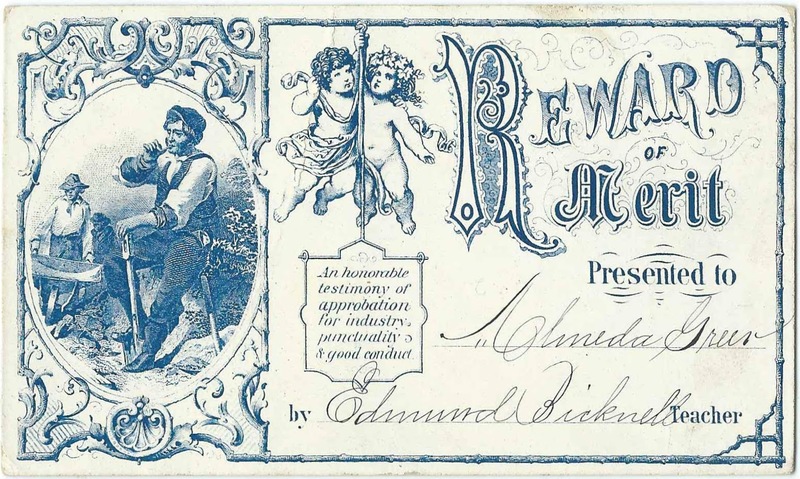 Edmund Bicknell was born July 23, 1846 at Belmont, Maine, the son of James Bicknell and Alvera (Pitcher) Bicknell. In 1874, Edmund married Susanna Bennett Dyer; by the time of the 1880 Census, they had moved to Lawrence, Massachusetts, where they would remain. Edmund was associated with the clothing firm Bicknell Brothers at Lawrence. Edmund, who died in 1913, and Susanna, who died in 1933, are buried in the Bellevue Cemetery at Lawrence, Massachusetts. Edmund's FindaGrave memorial notes that he was born in 1848, but the discrepancy might arise from a misreading of the date on his monument. The memorial contains the image of a brief funeral notice, which mentions that Edmund Bicknell was "one of the most prominent citizens of Lawrence". 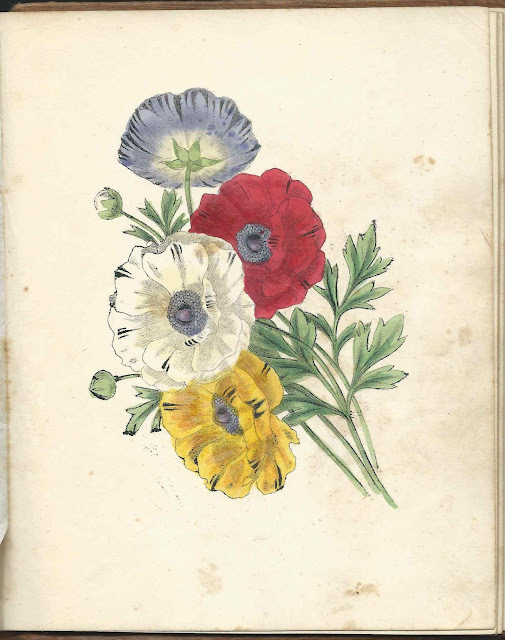 Edmund and Susanna had three sons, but, sadly, two died young, and their first born, Ralph Edmund Bicknell, died in young adulthood. Ralph had apparently been an accomplished photographer, and Edmund, to honor his son and presumably to assuage his grief, brought many of Ralph's photographs to light, from Ralph's Scrapbook, Illustrated by His Own Camera and Collection of Photographs. Almeda A. Greer was born about 1854, presumably at Belmont, Maine, the daughter of Daniel Greer and Mary C. (Shirley) Greer. Almeda, who never married, lived with her parents and then her brother Daniel and presumably helped out on the farm and in the household. She died in 1939 and is buried with family in the Hillside Cemetery at Belmont Corner, Maine. What I particularly love about this reward of merit is that it shines a bit of light on Almeda, for whom records are sparse. 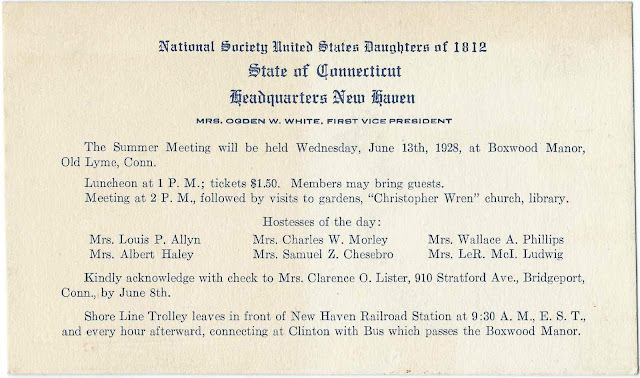 National Society United States Daughters of 1812, State of Connecticut, Headquarters New Haven. Mrs. Ogden W. White, First Vice President. Note: The National Society United States Daughters of 1812, still in existence today, is the group which pushed for acceptance of the "Star Spangled Banner" as the National Anthem of the United States. The national office in Washington, D.C. features the 1812 Memorial Library and a Museum. The Summer Meeting will be held Wednesday, June 13th, 1928, at Boxwood Manor, Old Lyme, Connecticut. Meeting at 2 P.M,, followed by visits to gardens, "Christopher Wren" church, library. Kindly acknowledge with check to Mrs. Clarence O. Lister, 910 Stratford Ave, Bridgeport, Connecticut, by June 8th. Shore Line Trolley leaves in front of New Haven Railroad Station at 9:30 A.M., E.S. T., and every hour afterward, connecting at Clinton with Bus which passes the Boxwood Manor. Mrs. Samuel Z. Chesbro - presumably Lucy (Haley) Chesebro (1877-1953), second wife of Samuel Z. Chesebro. Lucy was the daughter of Catherine (Haley) Haley and Albert Haley mentioned above. If you have corrections to the information above or information to share on any of the women mentioned, please leave a comment or contact me directly. 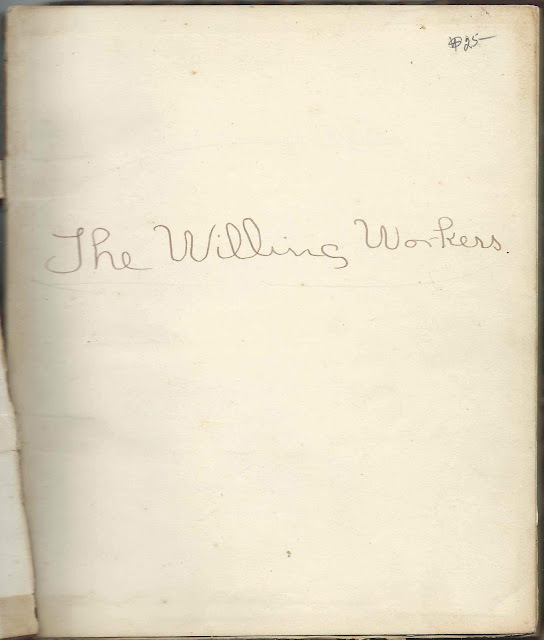 Journal containing minutes of meetings from 1904 to 1912 of the Willing Workers society of the Pacific Union Church at Westport, Massachusetts. Emily Frank Sisson (1886-1953) was the president throughout the years described. 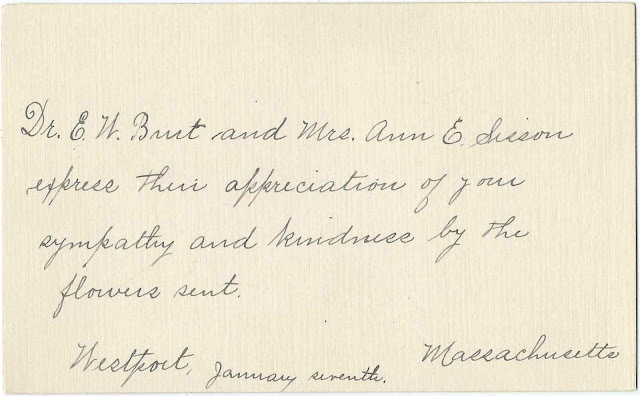 Tucked in the journal is an acknowledgement card sent to Emily and the Willing Workers - who presumably sent flowers to the funeral service of Charlotte Lena (Sisson) Burt, "Lottie", who died in December, 1911. 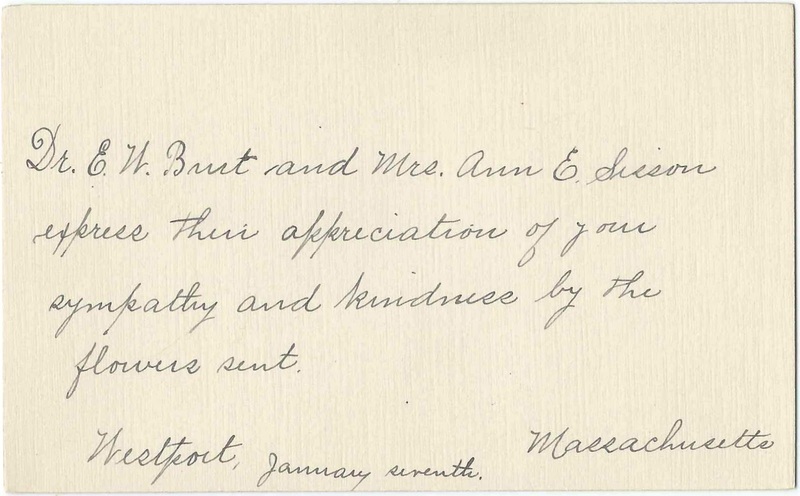 Lottie was the wife of Dr. Edward W. Burt and the daughter of Mrs. Ann E. (Wing) Sisson. 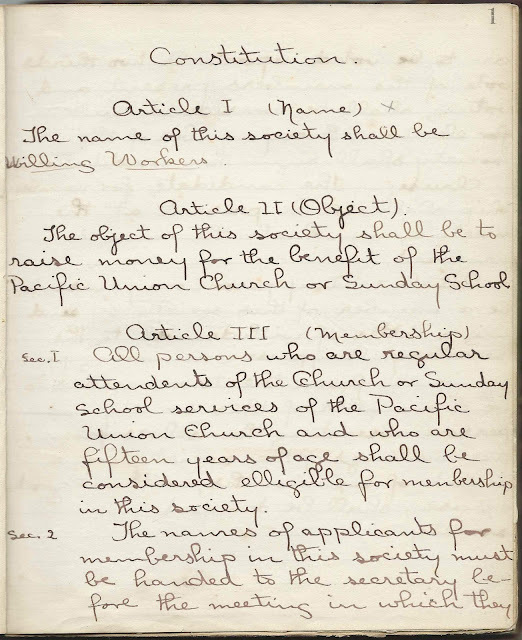 The journal starts with the founding constitution and continues on with minutes of meetings. It's remarkable how important organizations such as this were to the upkeep of the church and the life of the community. 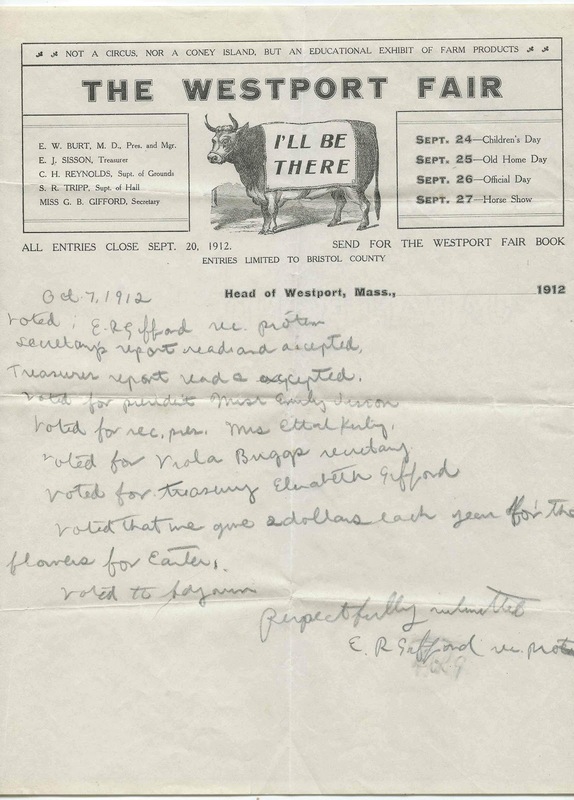 Also tucked in the album is a letterhead for the Westport Fair, which was drafted for use as notes for The Willing Workers meeting of October 7, 1912. If you have information to share on any of the people listed below, please leave a comment or contact me directly. 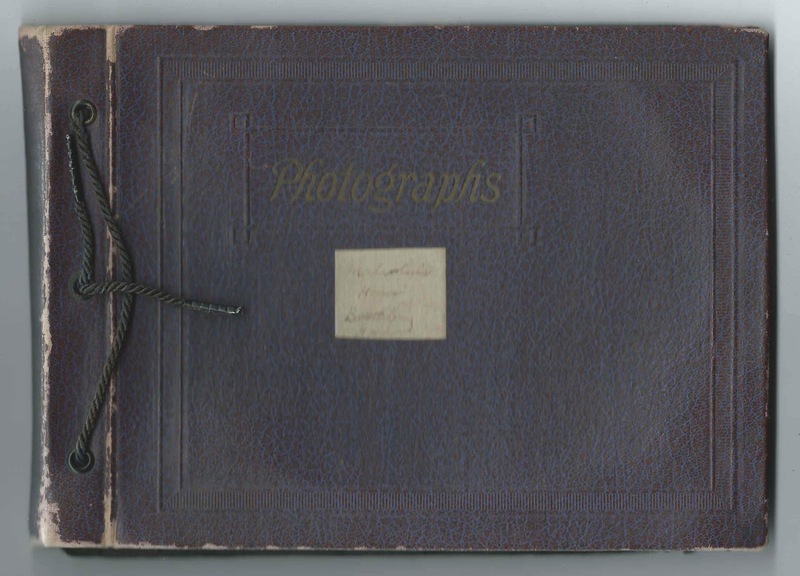 c1914-1930s album containing 22 photographs that belonged to the family of Malcolm Vartan Malcom and Georgine Lucie (Cuendet) Malcom of Boston, Massachusetts, with photographs of family members and their salt water farm on Sawyer Island in Boothbay, Maine. Malcolm Vartan Malcom was a champion of Armenian immigrants in the United States and authored The Armenians in America, published in 1919. Malcolm Vartan Malcom (Malconian) (1883-1967), a native of Turkey; Harvard University alumnus; attorney at Boston, Massachusetts. Because I don't own the copyright to these photographs, I'm not sharing them here. If you would be interested in seeing them offline, please contact me. If you have information to share on the Malcom and Farnum or Farnham families, please leave a comment or contact me directly. Please be careful about commenting on people who may be living or recently deceased, thanks. 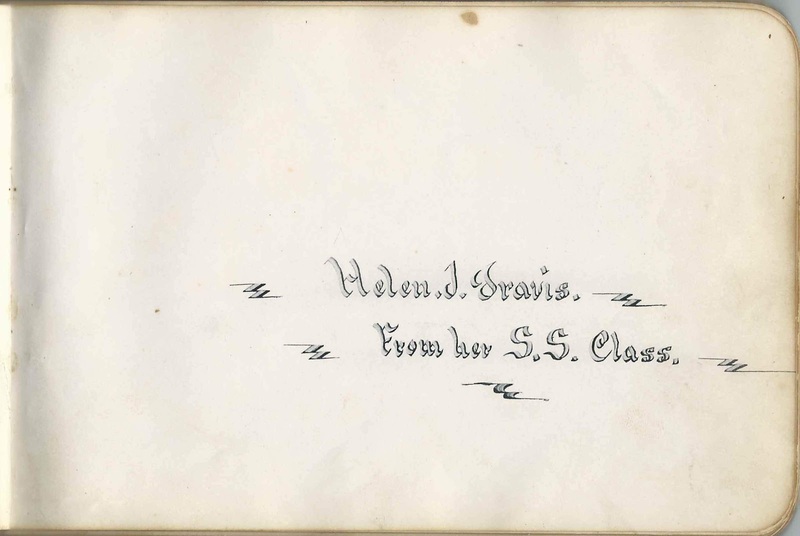 1880s to 1940 album originally owned by Helen Jane (Stuart) Travis (1850-1937) of Machiasport, Maine; presented to her by her Sunday School class. 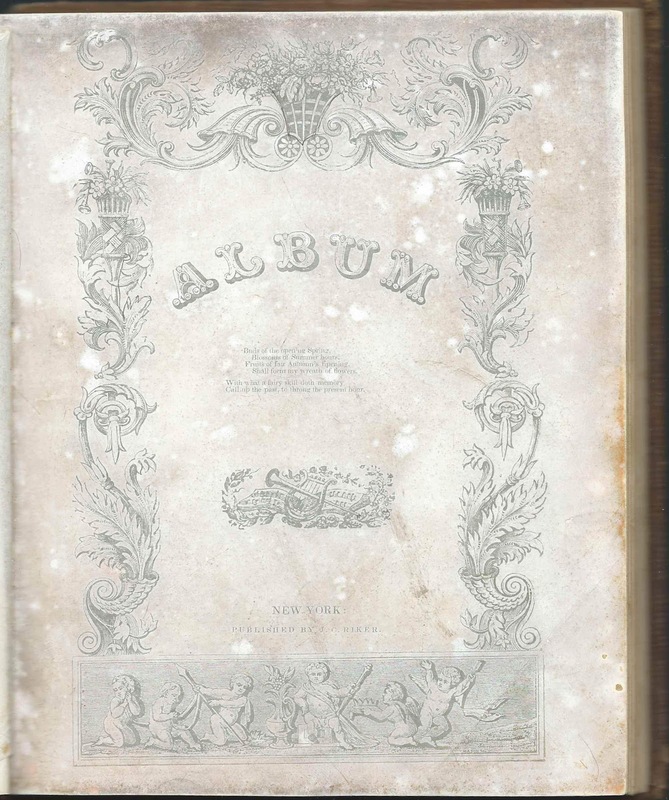 The album was used throughout Helen's life, it appears, and even beyond, perhaps by one of her children. The album measures approximately 7-3/4" by 5" and contains the sentiments of over 70 of Helen's relatives and friends. 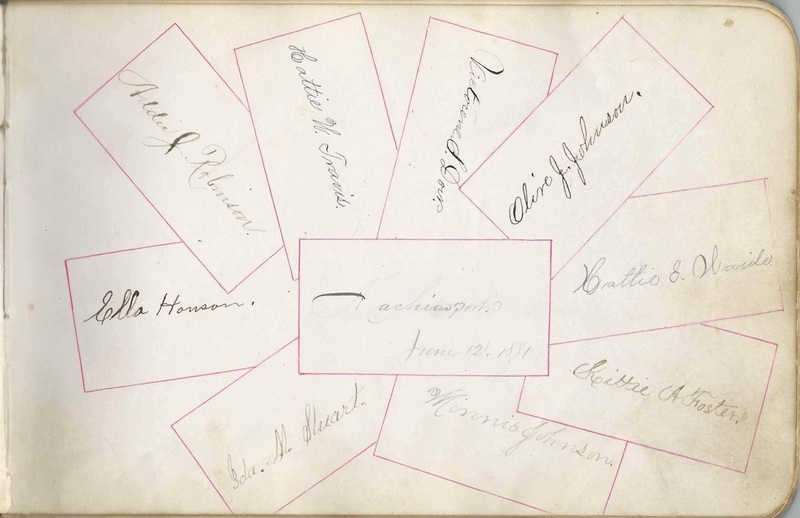 An alphabetical surname list appears just below, and an alphabetical list of the inscribers, together with any personal information they offered, appears at the end of this post. Helen Jane Stuart was born April 27, 1850 at Machiasport, Maine, the daughter of James Stuart, Jr., and Abigail T. (Gardner) Stuart. Ida's brother Frank L. Stuart inscribed a page in her album, as did an Ida M. Stuart, who was presumably Helen's sister Ida May Stuart. 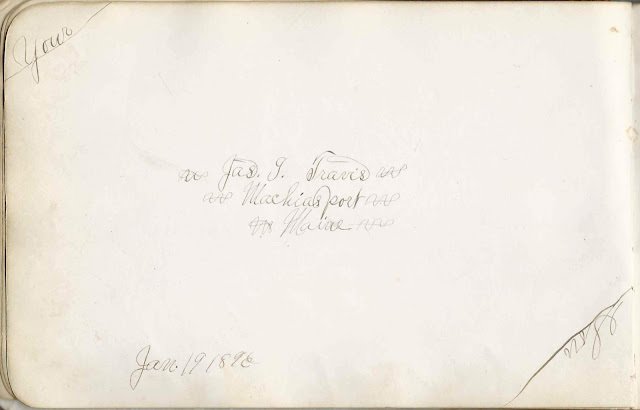 One of the inscribers on this shared page was Ida M. Stuart, presumably Helen's sister. About 1875, Helen Jane Stuart married Thomas William Travis (1851-1930), son of Caleb E. Travis and Mary L. (Higgins) Travis, also of Machiasport, Maine. Thomas was presumably the T. W. Harris who inscribed a page in the album in 1883. 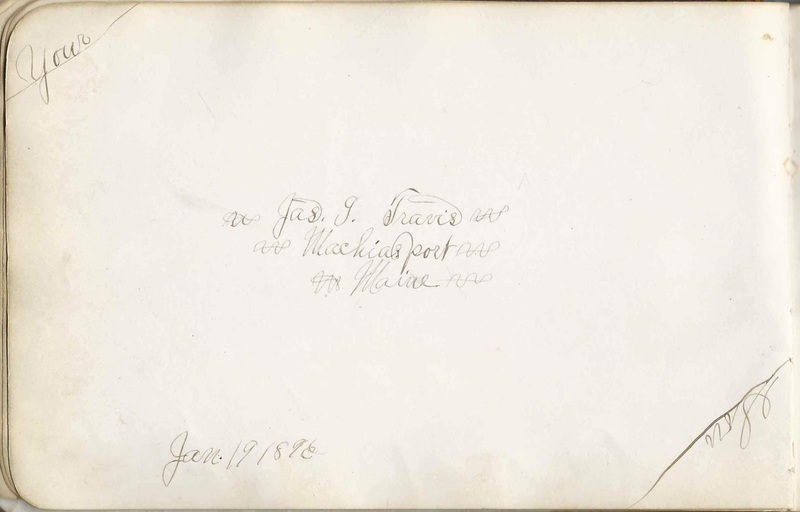 Other relatives of the Stuart and Travis families inscribed pages; refer to the list of inscribers below. Thomas and Helen had several children, at least one of whom inscribed a page in the album. Thomas William Travis died in 1930 and widow Helen Jane (Stuart) Travis in 1937. They're buried in the Church Hill Cemetery in Machiasport, Maine. If you have corrections and/or additions to the information above, or information on any of the people listed below, please leave a comment or contact me directly. Mary Cox of East Machias, Maine; inscribed on March 9, 1899. 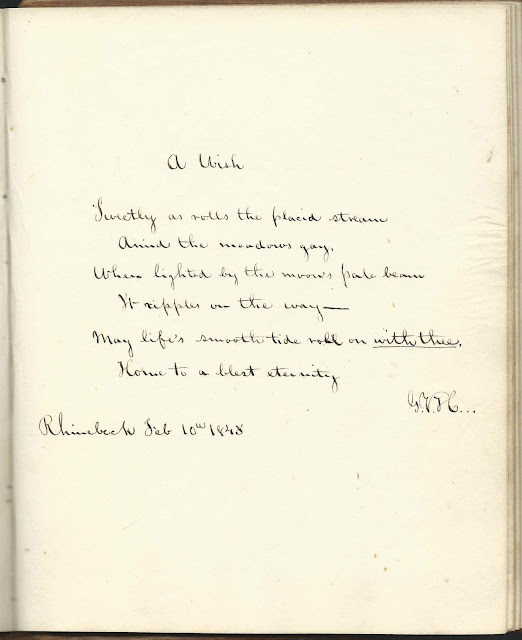 H. F. Day of Wesley, Maine; inscribed on September 12, 1883. 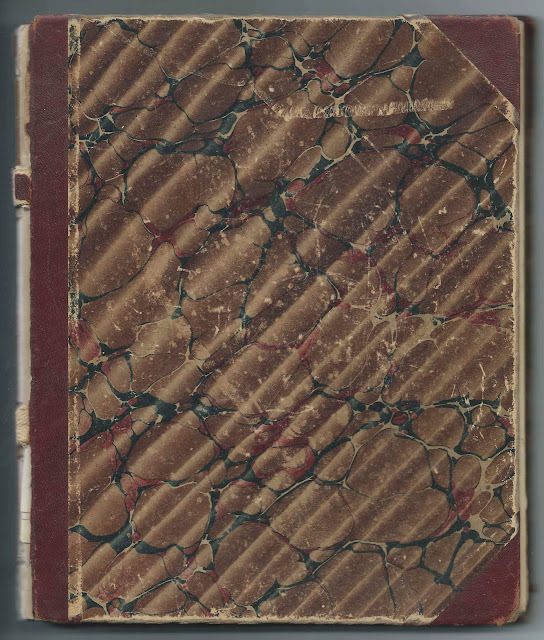 Postmaster Hiram F. Day, whose wife Ida May (Archer) Day inscribed the right facing page. 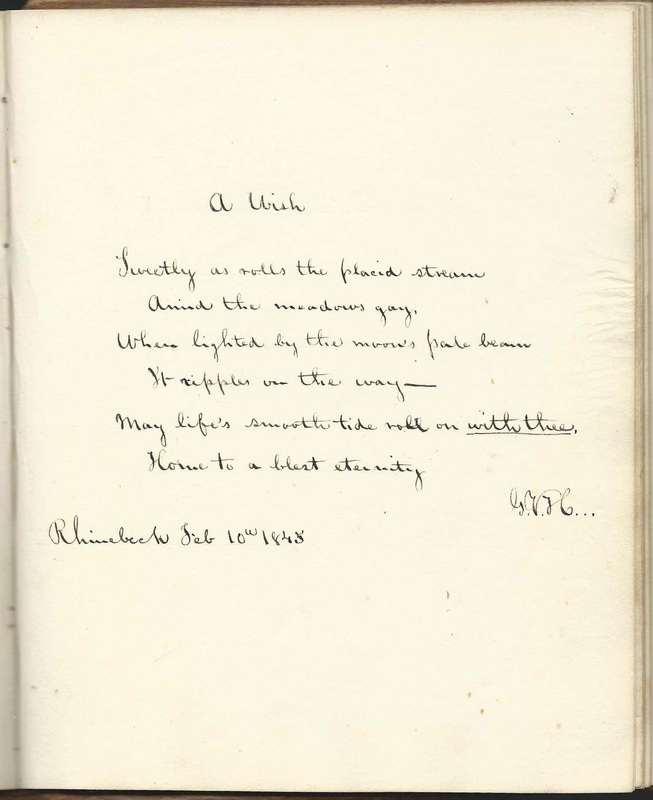 Ida May Day of Wesley, Maine; inscribed on September 13, 1883. 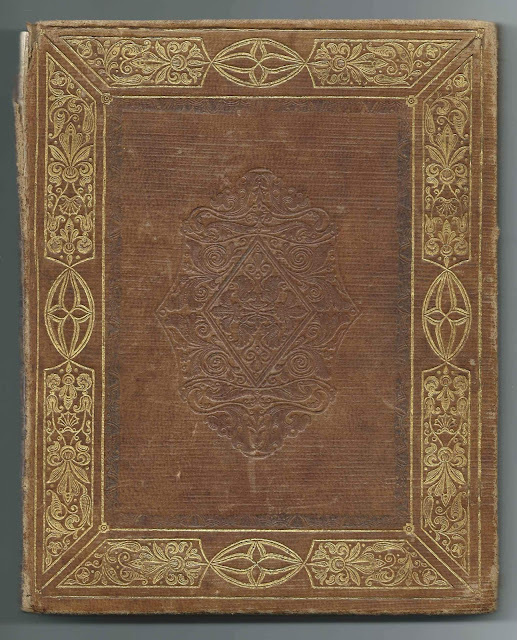 She was Ida May (Archer) Day, wife of Hiram F. Day, who inscribed the left facing page. 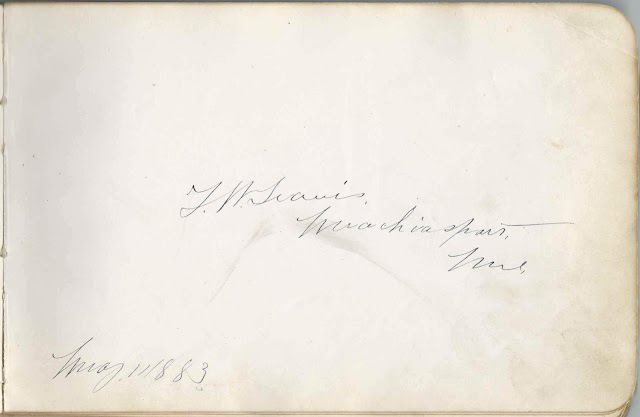 Arthur S. Hayward of Cooper, Maine; inscribed on August 22, 1883. His sister Flora Evelyn Hayward inscribed the right facing page. F. Evelyn Hayward of Cooper, Maine; inscribed at Machiasport, Maine, on August 22, 1883. 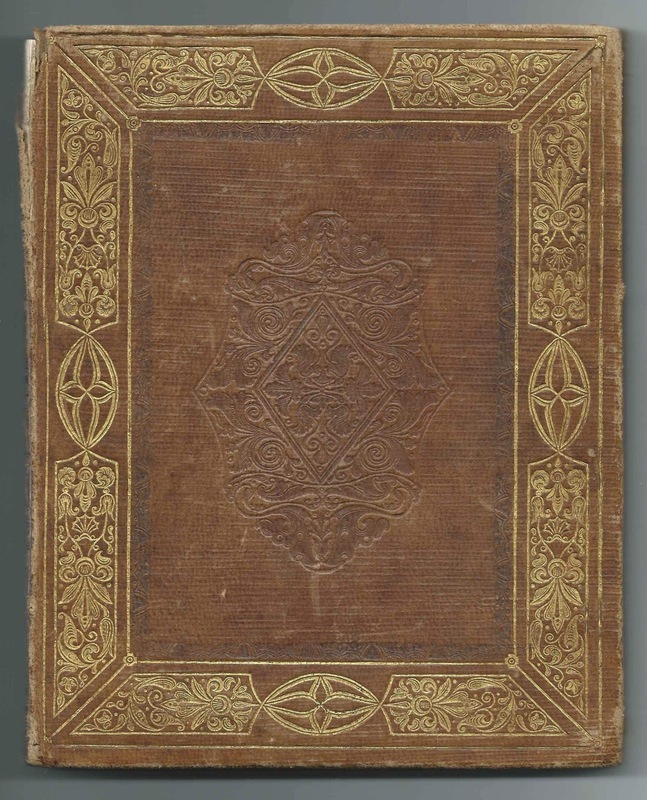 Flora Evelyn Hayward, whose brother Arthur S.Hayward inscribed the left facing page. Henry E. Robinson, Class of 1901 at Washington Academy, East Machias, Maine; inscribed on November 2, 1900; presumably the same Henry E. Robinson who inscribed another page.